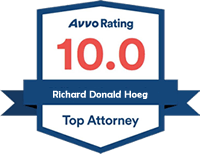 You should not act or refrain from acting on the basis of content included on this site without seeking legal or other professional advice, and your use of this website does not create an attorney-client relationship with The Hoeg Law Firm, PLLC, as an attorney-client relationship with The Hoeg Law Firm, PLLC can only be established after direct consultation and communication with one of our attorneys. The contents of this site contain general information and may not reflect current legal developments or address your situation. It is not legal advice, and we disclaim all liability for actions you take or fail to take based on any content on this site.